NEW! Enhanced Drawing Tools New tools mean more ways to create and achieve awesome results. NEW! Multiple Document Support Anime Studio now allows you to open more than one document at a time, and switch from one to another in a tabbed interface. NEW! Combined Bone Tools The scale, rotate and translate bone tool functions have been combined into the new Transform Bone Tool. NEW! Combined Point Tools The new Transform Point Tool allows you to move, resize and rotate any point you wish. More focus is dedicated to your drawings with live Freehand previews. NEW! Edit Multiple Layers Simultaneously Select multiple layers, including layers of different types, and apply changes to multiple layers at the same time. 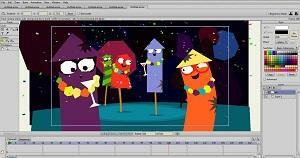 Create cartoons and animations from start to finish. 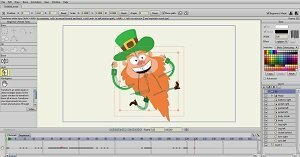 Everything you need to get started with 2D animation. 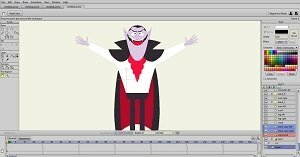 Access videos and sample files to master powerful features and start animating right away. Import your scanned drawings or existing images and photos then convert them to vector drawings with the click of a button. Trace as black and white or edges only and adjust a number of settings to style your vector image. Color your vector art, resize without loss in image quality and animate it using bones. 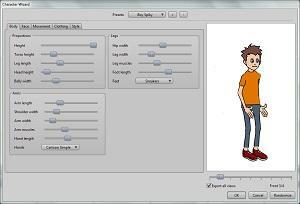 Quickly design ready-to-animate characters using the built-in Character Wizard. Select preset, dial-in body proportions, and choose from dozens of predesigned 2D components such as hands, feet, mouths, eyes, noses, and heads. Start animating right away by choosing Beginner's Mode. Get exactly the help you need for each tool or feature with automatic roll over tips and built-in tutorials and sample files. You don't even have to leave the application to watch a video tutorial. Add an object to an imported video that will follow the position and rotation of something, like a person's thumb. Just add tracking points that identify the item on the screen you want to follow. 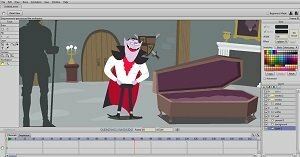 Add a soundtrack and lip-syncing to your animations. Record your own sound clips inside Anime Studio and adjust the pitch from high to low to fit your animated characters or import existing audio files into your project. Anime Studio will automatically insert them into your timeline, where you can adjust the timing and length to fit your scene. Using the Sequencer, freely move multiple sounds along the timeline to adjust syncing. Anime Studio supports WAV, AIFF, MP3 and M4A formats. Customize colors and fills for your objects using the Style palette. Add line effects such as Shaded, Soft Edge, Halo, Image Texture, and Gradients. 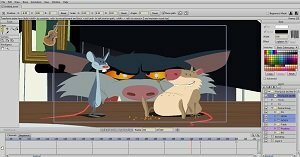 Apply a cartoon style effect to any image or video with a couple of mouse clicks. Easily select and remove unwanted background colors from your images using the Image Masking tool. Draw with pattern brushes and create perspective shadows with Anime Studio's layer masking feature. Wacom Multi-Touch support allows you to use Wacom's new generation touch tablets with Anime Studio. Easily edit characters, scale, rotate, pan, zoom in and out of the canvas with simple finger gestures. Available on Bamboo, Intuos, and Cintiq touch-based tablets. 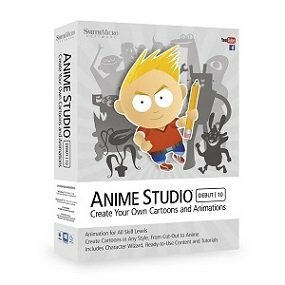 There is a huge variety of content included with Anime Studio. Browse through existing content, save your own creations to the library, and easily categorize content and search for items by keyword. Add selected content to your scenes through a simple drag and drop. New tools mean more ways to create and achieve awesome results. Anime Studio now allows you to open more than one document at a time, and switch from one to another in a tabbed interface. The scale, rotate and translate bone tool functions have been combined into the new Transform Bone Tool. The new Transform Point Tool allows you to move, resize and rotate any point you wish. More focus is dedicated to your drawings with live Freehand previews. You can now hide any point or bone you wish! Select multiple layers, including layers of different types, and apply changes to multiple layers at the same time.